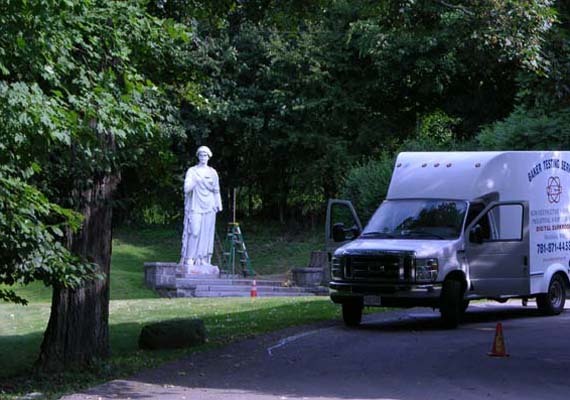 In the spring of 2012, the George D. and Margo Behrakis Gallery (gallery 207) in the Behrakis Wing welcomed a 13-foot marble sculpture of the goddess Juno. Due to its enormous size, the sculpture was airlifted into the gallery through an opening made in the roof. Over the next several months, conservators treated the sculpture in situ, giving visitors a rare chance to observe activities which normally take place behind the scenes. See the updates posted below to learn how the sculpture was moved into the building and how treatment progressed. 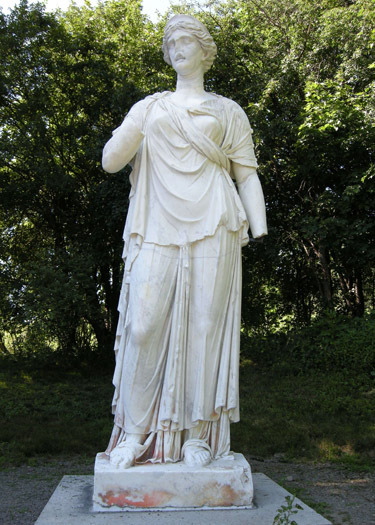 The colossal Roman sculpture, recognizable as Juno by her diadem, drapery, and facial features, was acquired for the Museum in 2011 by anonymous donors. Dating to the Trajanic or Hadrianic Period (early second century A.D.), it is the largest Classical marble statue in North America. While much of its ancient history remains a mystery, the sculpture was part of the Ludovisi Collection and appears in an 1890 photograph of the Ludovisi Gardens in Rome. Shortly thereafter, it was purchased by Mary Pratt Sprague and in 1904 moved to the United States. 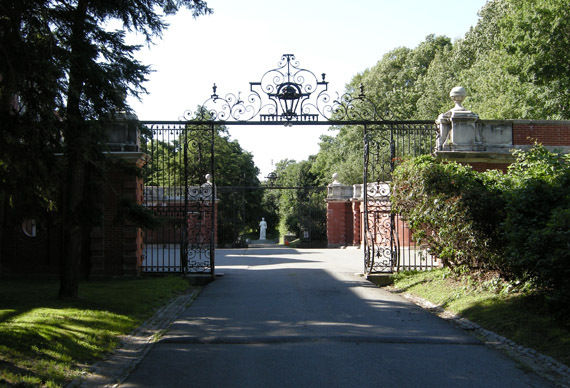 According to legend, it took twelve oxen to haul the figure into place at the axial focus of a long driveway at the Brandegee Estate in Brookline, Massachusetts. Relocation from the Brandegee Estate to the Museum will be a challenging undertaking, but the move indoors is a crucial step in its long-term preservation. More than one hundred years of exposure to the harsh New England climate, including acid rain and freeze-thaw cycles, have severely degraded the marble surface and caused cracking. Biological growth has been extensive despite various cleaning campaigns. A peculiar pink stain appears at the base of the figure (the cause of which may be determined through examination of marble cross sections), and sadly, there is evidence of vandalism. Problematic for transport and handling are the proportions of the goddess, standing 13 feet tall with an estimated weight of about 13,000 pounds. A deep crack at waist level renders the figure unstable. Past repairs include the addition of a new nose and lips, as well as toes, all of which have since been removed. The head and proper left lower arm, which had previously broken off, were reattached at an unknown point in time, the latter with an archaic-looking iron bracket at its bottom edge. In preparation for the move, examination by gamma-radiography and ground penetrating radar will be carried out in an attempt to assess the extent of existing metal pins. The cracked torso will require structural stabilization; after selection of the most suitable access points, core drilling will allow the setting of anchors and internal pins to bridge the crack. A metal armature will be designed to cradle, protect, and immobilize the statue during the move, and the head and arm will likely be removed temporarily to prevent damage during transport. For transfer into the building, the sculpture’s size and weight dictate an entry point through the roof, at the end of an adjacent gallery (Italian Renaissance, gallery 206) in the Behrakis Wing. A skylight will be opened to allow a crane to airlift the cradled statue.Significant changes will be made to the galleries along the moving path to allow maneuvering of the sculpture into place and for the temporary installation of moving equipment. Due to the galleries’ maximum floor load capacities, a wide base will be constructed to properly distribute the weight between floor beams. In the gallery, the sculpture will be mounted on a large steel-reinforced pedestal, and the steel frame which protected it during transport will be disassembled. Conservation treatment will then proceed in situ to address surface condition, consolidation, reattachment of the head and arm, and other aesthetic issues of loss compensation, while in the lab, stable isotope analysis may help to identify the exact type of marble and possibly even the quarry from which the stone originated. See below for updates as work progresses. The multimedia guide was made possible by the John and Sonia Lingos Family Foundation. Additional support provided by Jeffrey A. Choney and Pamela Dippel Choney, as well as members of the Art of the Ancient World Visiting Committee, staff, and MFA Fund donors. Watch a short video on getting Juno ready for her move to the MFA.